Each round ends when all titles in the Deck of Fame have been guessed. All cards used are put back into the Deck for the next round. High score after the third round wins. Divide into teams with team members sitting across from each other. 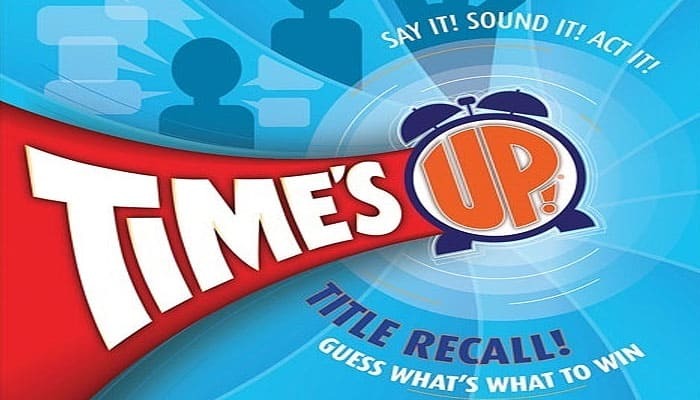 Time's Up! works best when played in teams of two players each. (Three teams of two, for example, is better than two teams of three). With more than ten players, larger teams will be necessary. (See end of rules for odd number of players). Choose a player to keep score. Decide whether you'll be using the YELLOW or the BLUE titles. Make sure everyone knows which color you're using! Do not mix colors within the same game. Deal out 40 cards evenly among all players (for a longer game, deal out more cards). Then deal two more cards to each player. The rest of the deck won't be used and should be put back in the box. Each player may look at their cards and discard two of them. (Players should not reveal their cards to each other). All remaining cards are then shuffled together and stacked face down in the center of the table. This stack is the Deck of Fame. Choose a starting team to take the Deck. The next team clockwise from the starting team takes the timer and will use it to time the other team's turn. Almost anything goes with cluegiving but passing is not allowed. On each team's turn, one member of the team is the Cluegiver and the rest are the Guessers. (On successive turns, the Cluegiver will be a different member of the team). The Cluegiver takes the Deck, draws the top card from it, and looks at the YELLOW or BLUE title depending on which color everyone agreed upon at the start. Once the Cluegiver has looked at the title, the next team says, "Go!" and starts the timer. The Cluegiver begins giving clues to his teammate(s). The Cluegiver can say or do almost anything: he can make sounds, point, charade, give full descriptions of the title, etc. No singing or humming of music is allowed. No part or variant of the title can be used in the clue. Ex: You can't use "Willy" or "Bill" to get the Guesser to say WILLIAM. "Rhymes with" clues are acceptable, provided the Cluegiver doesn't actually say the rhyming word. Ex: "Sounds like the animal that oinks" would be OK, but not "Sounds like pig". No spelling of the title is allowed, nor is any clue designed to give away specific letters of the title (the only exception is for titles using initials, such as E.T. : The Extra-Terrestrial, although for such titles the cluegiver is still forbidden to say the initials outright). The Guessers try to guess the title on the Cluegiver's card. The Guessers can make as many guesses as they wish; there is no penalty for a wrong answer. Guessers must say the full title as printed on the card, although words in parentheses are optional. If the Guessers call out the correct title, the Cluegiver sets the card aside, draws a new card from the Deck, and begins giving clues for the title on that card. The Cluegiver cannot pass and move on to a new title until the Guessers call out the correct title. If the Cluegiver doesn't recognize the title he draws, he'll have to be more resourceful with his clues (see Tips, next page). If the Cluegiver gives an illegal clue, his turn ends immediately and the card he goofed on is returned to the Deck. When time expires, the Cluegiver shuffles the card he was currently working on back into the Deck. He keeps each card that was guessed correctly in a pile near him. 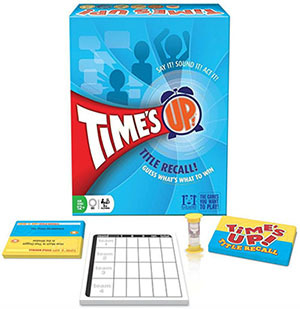 Pass the Deck to the next team clockwise, who in turn pass the timer to the next team clockwise from them. Important: If time runs out before a title is guessed, players may NOT discuss the title with each other. The cluegiver can't reveal what he was trying to convey, and players on other teams who think they figured it out can't tell their guesses to each other. A card may come up multiple times before it is guessed correctly. The round ends when all titles have been guessed and the Deck is empty. When the deck runs out and all titles have been guessed, pause the timer by placing it on its' side. The current team will take the first turn in the next round, using only the remaining time on the timer. If they feel there is not enough time left to use, they can pass to the next team who will start the round with the sand timer reset back to 30 seconds. Each team now adds up all the cards they collected and score 1 point for each card. The scorekeeper tallies the score. After scoring, each team reads aloud all the titles from their pile of cards to refresh everyone's memory about which titles are in the game. When all titles have been read, put all the cards back into the Deck and shuffle them well. The team after the last team to play starts the next round. No more than 1 word can be used in each clue, 1 guess only, passing allowed. 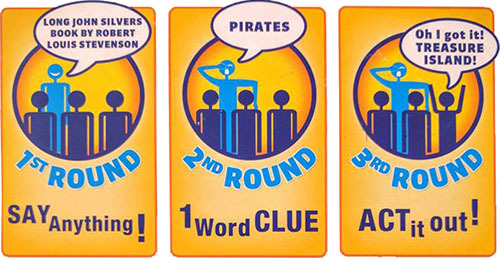 Round 2 plays just like Round 1, with the following changes: The Cluegiver may not use more than one word per card to describe each title. 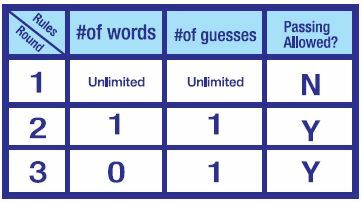 The same word may be repeated as often as desired, but once a word is said only non-verbal clues may be added. If the Cluegiver accidentally uses more than one word he must set the card aside face down, draw a new one from the Deck and continue with the new title. Each team may make only 1 guess per card. If the guess is incorrect, the Cluegiver must set that card aside face-down, draw a new one and continue with the new title. The Cluegiver may pass during this round. To do so, simply say "Pass", set the card aside face-down, draw a new one from the Deck and continue with the new title. At no point are Guessers ever allowed to Pass. At the end of the turn, any cards set aside due to passes, clue goofs, or incorrect guesses are shuffled back into the Deck. There is no penalty for such cards. If a Cluegiver finshes the deck during thier turn, their turn is over. They are not allowed to revisit cards that they set aside due to incorrect guesses, passes, etc. At the end of the round, don't bother reading all the titles aloud again; everyone should know them by now. Shuffle all the cards back into the Deck again as before. Only pantomime and sounds, 1 guess only, passing allowed. Round 3 plays just like Round 2, with the following change: The Cluegiver may not use any words at all. Only sounds and pantomime. The team with the highest score after all three rounds is the winner. Ot - Other (Famous Places, Items, Phrases, Magazines and more). Pm - PLAYS & MUSICALS.